1. Divide the input which we have to sort into two parts in the middle. Call it the left part and right part. 78 and the right part will be 91 1 0 6. 2. Sort each of them separately. Note that here sort does not mean to sort it using some other method. We use the same function recursively. 3. Then merge the two sorted parts. Input the total number of elements that are there in an array (number_of_elements). Input the array (array[number_of_elements]). Then call the function MergeSort() to sort the input array. MergeSort() function sorts the array in the range [left,right] i.e. from index left to index right inclusive. Merge() function merges the two sorted parts. Sorted parts will be from [left, mid] and [mid+1, right]. After merging output the sorted array. It takes the array, left-most and right-most index of the array to be sorted as arguments. Middle index (mid) of the array is calculated as (left + right)/2. Check if (left<right) cause we have to sort only when left<right because when left=right it is anyhow sorted. Sort the left part by calling MergeSort() function again over the left part MergeSort(array,left,mid) and the right part by recursive call of MergeSort function as MergeSort(array,mid + 1, right). Lastly merge the two arrays using the Merge function. It takes the array, left-most , middle and right-most index of the array to be merged as arguments. Finally copy back the sorted array to the original array. Here's a Java Applet Visualization which might help you get a clearer idea of what exactly happens in merge-sort. /* Logic: This is divide and conquer algorithm. This works as follows. -10 32 45 -78 and the right part will be  91 1 0 6.
method. We already wrote fucntion to sort it. Use the same. (3) Then merge the two sorted parts. 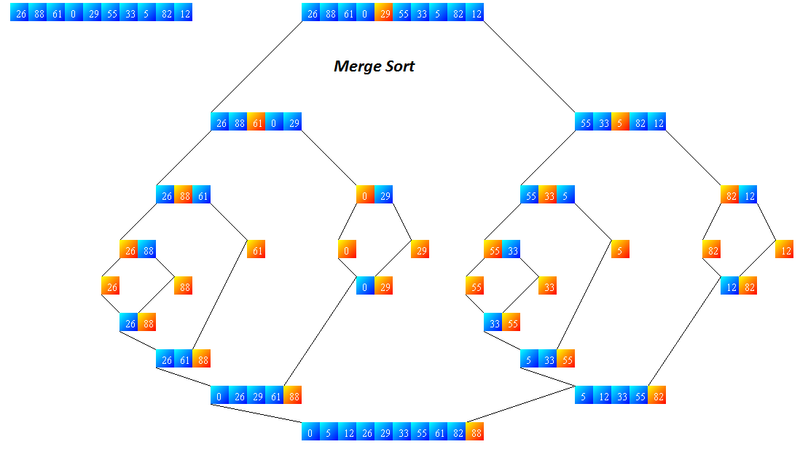 /* Merge functions merges the two sorted parts. Sorted parts will be from [left, mid] and [mid+1, right]. -10 32 45 -78 and the right part will be  91 1 0 6.